Swashbuckling Adventures in Fantasy Sapce! Beyond the clouds, wonders await for those who rise to meet the call. 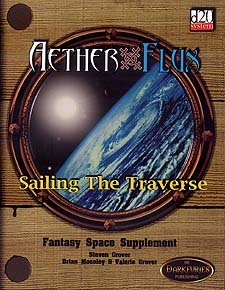 As sailing ships and elven ormralest embark into the traversal frontier heroes' lives are forever changed. Spacefarers come for gold or glory,and the traverse stands ready to test their mettle. From the seedy port of Maythorne's Wheel to the deadly realm of Lyriah, a great ocean lies amongst the stars. * New spacefaring spells, feats, and items. * Over 30 classic and fantastic ship designs. * Complete deckplans of eight aetherships, and the harbour of Maythorne's Wheel. * Three traversal ages, from Emergence through Exploration to the climactic Empire. Requires the use of the Dungeons & Dragon Player's Handbook, Third Edition.